Red is the color of February! It stands for the two main celebration for this month. And what a coincidence, they were both celebrated on the same date this year - February 14! Yup, Valentines Day and Chinese New Year will be both celebrated this coming February 14. And since two event in one day, everybody prepares for it! 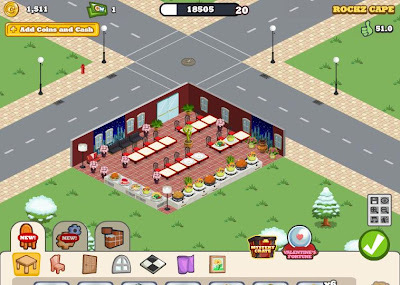 In accordance to this celebration, I also designed my cafe in my favorite Cafe World game in Facebook using this theme! Just like what you see, your favorite Rockz Cafe is now dressed in red! Red is the symbol for love. Red then is a symbol for goodluck in Chinese beliefs. So, combining love and goodluck for a fortune and prosperity, I used the Valentine and the Chinese New Year for my cafe. Starting from the flooring, it is designed with pale-red tiles. To blend it with the walls, I used a dark red paint. Of course you would see a blue portion of the walls depicting buildings and towers. Yeah, I put this blue portion since according to the Chinese Horoscope, blue is the luckiest color for this year! Now look at the chairs and tables, there were perfect match! I chose the red chairs to combine with the red-white square dinning tables. See, they were perfectly blended! Of course to spread love and prosperity, I surrounded my place with light-red ornamental flowers! More and More Customers were Attracted! 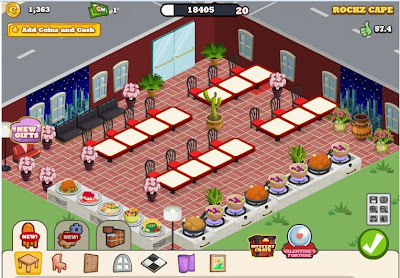 What can you say with my design and cafe theme? Do you love it?! Proud to say that I am now on Level 20 of the game! And my earnings keep on increasing! This enables me to buy other things and designs for my cafe! Actually those designs and materials here in my cafe were so expensive that's why my income lessen why I buy those things! 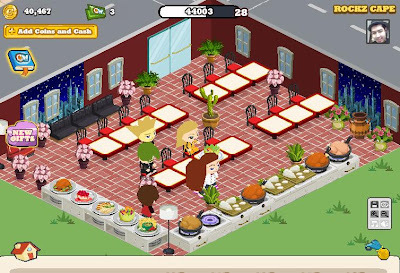 But it doesn't matter since I was fulfilled and satisfied with the looks and styles of my cafe! Just like what I have said before, I will keep you updated with my cafe world addiction. 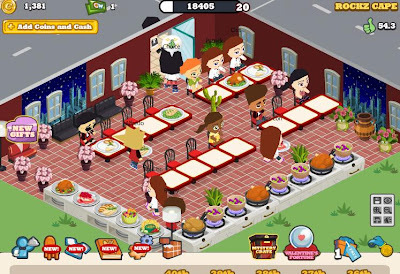 Time to time whenever new designs and developments were made in my Rockz Cafe, I will let you know it! Are you satisfied with my latest design? Of course new dishes and desserts were serve there for your Valentines date and Chinese Eve dinner! What more do you want to add? 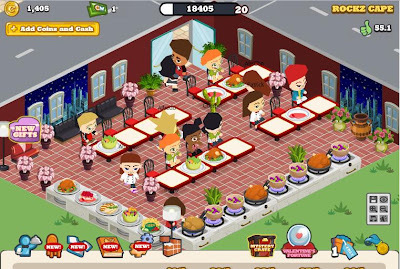 Bakit yung design ng cafe mo parang di restaurant? Yung ayos ng mga tables parang katulad sa mess hall ng kampo. Mas maganda i-design mo ung ayos ng furniture mo.